Quibble Coinbiter Returns... for EVIL! 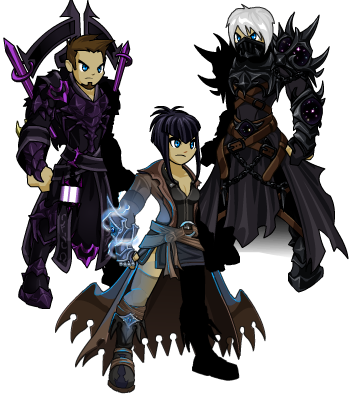 Prepare... for DARKNESS with Quibble Gear! Quibble is in Battleon this weekend, heralding the coming of the Throne of Darkness Saga next month! He's selling most of his gear for AdventureCoins, but has a few things for everyone... if you can meet his price! What Will Quibble Coinbiter Bring? If you've seen Quibble appear before, you know that his arrival heralds the beginning of the next main storyline... so THIS time around, he's bringing gear from crafted in honor of so many heroes' favorite alignment: EVIL! He never stays in one place long and we have no idea when (or if) he will be back. Remember, he is not selling rares, he is selling items you are not even supposed to have! What is a Quibble Coinbiter? 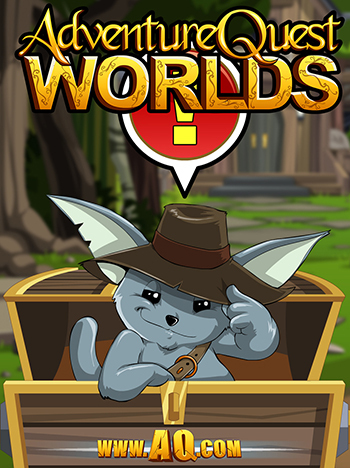 Quibble Coinbiter is everyone’s favorite sales Moglin, who travels far and wide, collecting never-before-seen Items to add to your impressive collection. That's right, his gear has never been seen in the world before, but he sells them used... How is this possible? Quibble has a connection with a slightly corrupt time-travel fairy who supplies him with items that have not even been created yet*. No one knows if—or when—Quibble’s Items will go permanently Rare, so your best bet is to get all the goodies in his shop just in case it’s the latter! * Thinking about this should hurt your brain. It hurts mine! ** I wonder... if the item's used, but never seen before... is the time travel fairy going to the future after you have discarded the weapon, taking it from you, and then coming BACK in time so Quibble to sell it to you before you ever found it***? 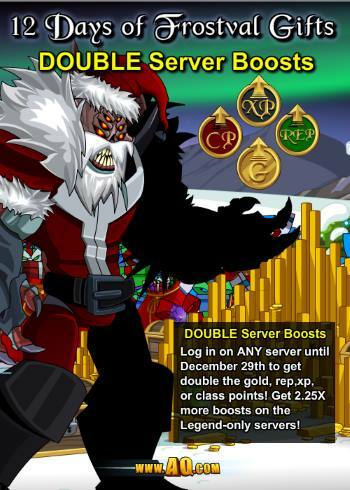 Nulgath Returns with Gear in Quibble's Frostval Shop! 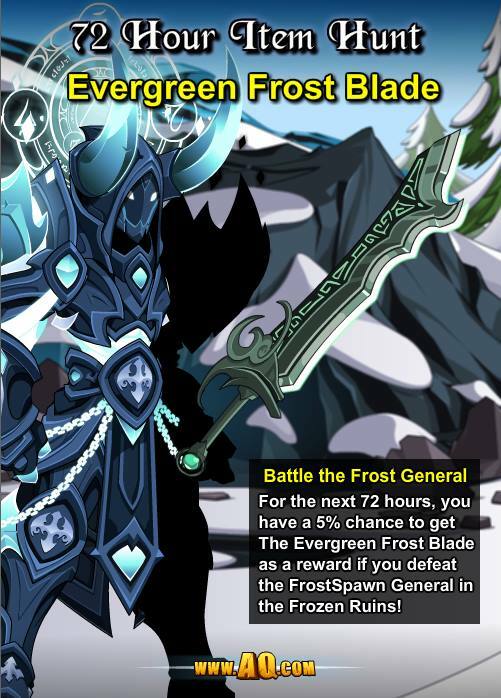 Nulgath the ArchFiend returned to AdventureQuest Worlds last week and brought the CryoFiend and Assassin of Nulgath armor sets to Quibble's 2015 Frostval shop! All-new gear will be added to the shop later tonight at midnight on Christmas Eve! 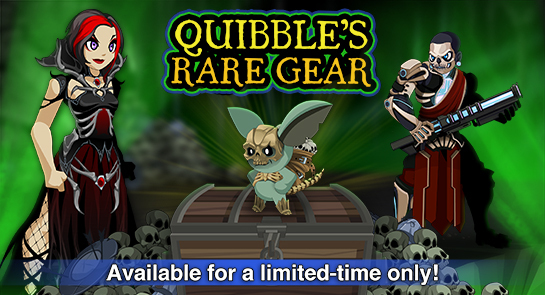 Quibble's Gear will be available until January 8th... but once his shop leaves, it will be gone forever! 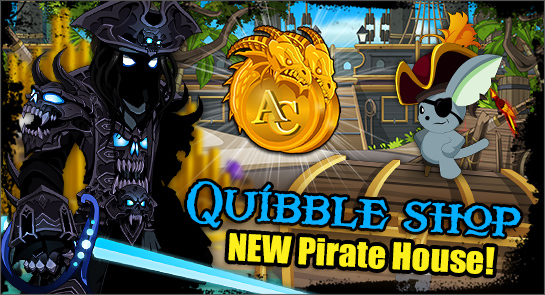 Reminder: Quibble's Talk Like a Pirate Armors Leave Tonight! Don't miss your last chance to get the Paragon and Mechanical Naval Commander armors or the Arcan Pirate Captain sets! 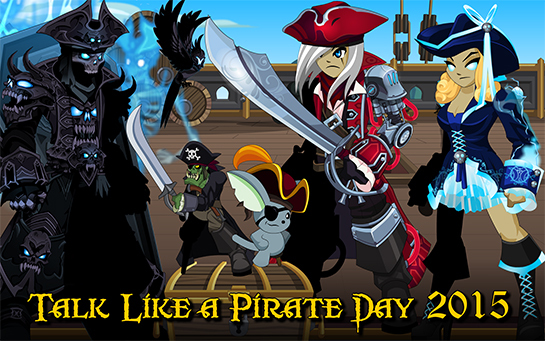 The Naval Commander CLASS and armor will return with NEXT YEAR'S Talk Like a Pirate Day Quibble shop, but none of the other rare gear will ever be available again! Quibble's Pirate Adventure House Leaving Soon! Since we had to move Quibble's shop into the game menu, his house shop was temporarily unavailable this past week. So, while his Rare GEAR Shop will leave tonight, his Rare HOUSE Shop will be available for one more week! You'll find that back in your game menu until next Friday starting with tonight's release! 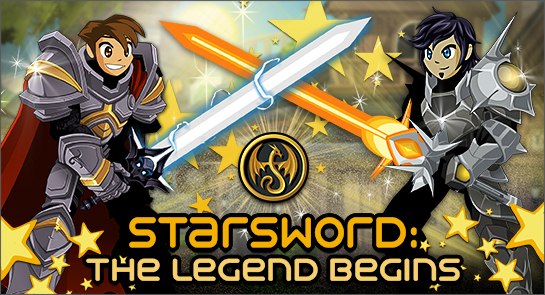 Starsword: The Legend BeginZ TONIGHT! 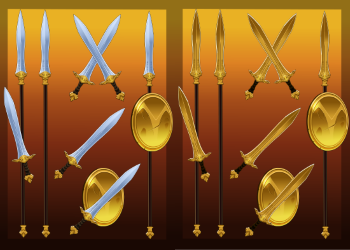 AQWorlds 1st - 6th Upholders Can Learn the Origin of the StarSwords! We could not build our games without the support of our long-time, loyal heroes, so we want to show them where one of their most-loved weapons comes from. If that is YOU, then /bows - thank you for helping us keep AQWorlds alive, and we hope you enjoy what we've created! The story is written and designed by two of our newest, most SUPER-SLAYIN' team members, Aeon and Venthos, and together their skill is OVER 9000! Rewards include the Starsword Commander helm and armor PLUS new starsword-themed weapons that will match your existing starsword! 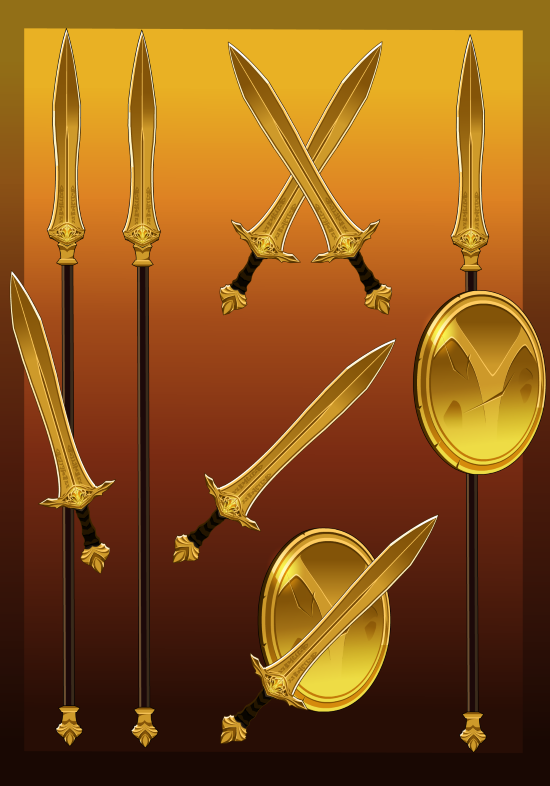 So if you are only of the lucky owners of the Golden Starsword, for example, you'll be able to get the Golden StarStaff, Daggers, Scythe, and Cape! IF you can defeat the boss in next week's release, you'll ALSO have a chance to get the much-sought after Orange Starsword! 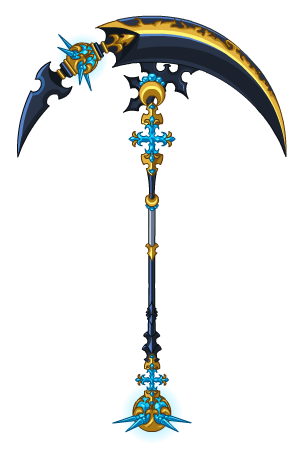 Upholder collectors have been waiting for YEARS to pick up this blade! Additional rewards will include the Lava Starsword, the rare Nimbus Cloudrider Armor, the Rainbow Double-Bladed Polearm, and more! If you are NOT an Upholder, then GOOD NEWS! 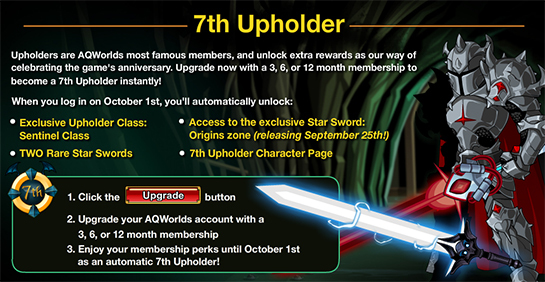 You can upgrade now with a 3, 6, or 12 month membership and instantly become a 7th Upholder. Then, on October 1st, you'll be able to battle down DragonRoad, too! Pirate Class skills get an update tomorrow - check out the skills writeup here! The Blazebeard boss now drops the Jolly Roger pet! Find him in the /blazebeard map and get battling! EVERYONE can /join battlecon and take on the Rogue Frogzard for a chance to get the Grand Theft Frogzard pet! Get up to 25% More Free AdventureCoins Until Next Wednesday! School will be in session for months, but the Back to School AdventureCoin Bonus ends September 30th! Don't miss your last change to get up to 25% more free AdventureCoins with any AC package, then check out Quibble's soon-to-be rare pirate gear! NEW this week in Quibble's Shop: Pirate Adventure House! 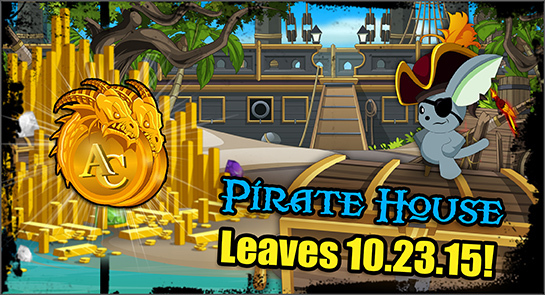 Talk to Quibble in Battleon to find the Pirate Adventure House for 2000 AdventureCoins and make sure you have a place for your entire crew to /rest between battles! The house has 8 rooms, including 2 jungle-themed hangout areas, plus 3 on-deck frames and 2 ship interiors to decorate! This house will ONLY be available until Quibble's shop leaves, and he won't be around much longer. With 8 rooms, this is one of the biggest houses in the entire game! So rally yer mates, and get t' adventurin'! Earlier today, we added a shop to the PTR Tester badge in the Book of Lore. This was for heroes who helped us test WAY back in 2010, and the goal was to let them recover an item they may have lost or sold. When we checked the dates to determine that the badge we were placing the shop on matched with the item we wanted to give access to, the dates appeared to match up... but we were incorrect. Because players who did not originally unlock the Guardian Shadow Cape were getting it, we have removed the shop from the PTR Tester badge, and in the morning will do a sweep to remove it from accounts which should not have it. I apologize for any frustration this has caused, and hope you enjoy this weekend's coming release! Pirates be lovin’ some booty! Har har har! And ye too can plunder yer loot from Quibble’s Treasure Chest makin’ landfall in Battleon this weekend. Some o’ thee best booty in all the seven seas includes the gear he brings in fer this fan-favorite holiday! Both the Paragon and Mechanized Naval Commanders, an' th' Arcane Pirate Captain above be so amazin'ly beautiful that people be BOUND t' demand their return in years t' come but rares be rares. Get them now or miss out. We also have t' Explorer Commader Class and t' all-new piratical pets, too! PS: the Legion helms and weapon and the Mechanical Naval Commander helms will be added in game tomorrow, ON Talk Like a Pirate Day. This Captain has a crew full of sailors who are ready to head for port, and need to stop and fuel up first! Same with Quibble's quests. Battle to Take Down the Dread Pirate Mage Blazebeard! Avast! As Talk Like a Pirate Day nears, Quibble Coinbiter's ship is approaching Battleon Bay, me hearties! This Friday, check out his chests full o' th' newest nautical gear ... then head out t' sea to stop th' Dread Pirate Mage Blazebeard... an' get ALL his loot! Slam the lorepedos and BLAST the Mana Cannons this Friday! PLUS... Th' Lorepedia crew have crafted a Talk Like a Pirate Day guide fer ye... read on to see a preview of what they've hauled in! Arrrr Matey's here be ye Guide Preview for TLAPD. Quibble's has plundered some loot if ye be finishin' his quests. This map and quests are only avaliable during the Talk Like A Pirate event. What to do: Complete all of Quibble's quests for the "Avast" character page badge. (Must be an active Legend to get the badge). Captain Rhubarb has a pirate quiz for you. If ye answer incorrectly ye be sent to Davy Jones' locker to fight a sea beast. Are you ready for an all-new AQWorlds? Journey to Northpointe, your hometown on Drakonus, and embark on the Ancient Evils storyline! More juicy details here! 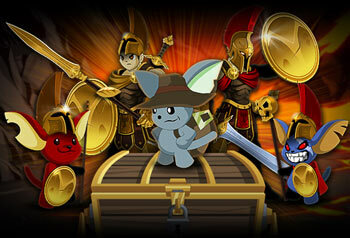 Your favorite rare-item collecting Moglin, Quibble, is back in Battleon! Log in this Friday and score an onslaught of Firestorm Onslaught items! Check out the full details here. What luck: the unluckiest day of the year is 1 day before the loveliest day of the year! Stay tuned for major Special Event Spoilers on the Design Notes! The new continent Drakonus is waiting to be explored. Invite your friends and join us as we journey to Embersea Isle to continue the new storyline! Epic loot for the real world! 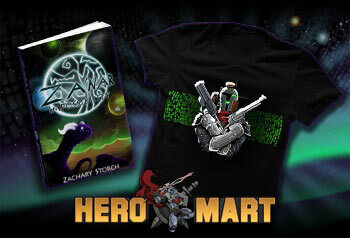 HeroMart has tons of T-Shirts, Toys, Posters, Books, Music, and more—all with exclusive in-game items! Shop now! Quibble's Gear is on Fire! First Look at the new Firestorm Quibble Gear! 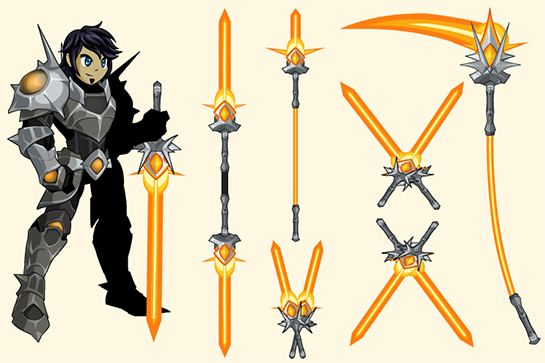 Firestorm gear from the past, present, and future is burning the leather of Quibble Coinbiter's pack... and all of it is ready to blaze into YOUR inventory! AQWorlds' very own time-traveling sales moglin arrives in Battleon this Friday, February 6th, but he won't be there long, so you'll want to dig through his chest of never-before-seen-slightly-used items and rares while you can! 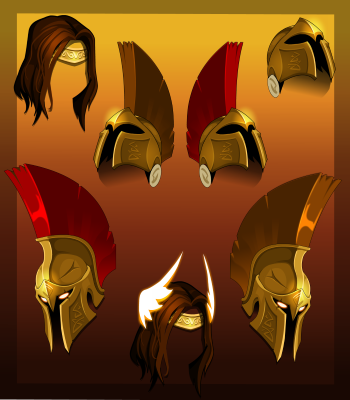 Keep reading below for previews of Dage's Firestorm Onslaught Spartan gear! Not exactly sure who Quibble is, or how he gets all that gear? Neither are we... for sure. But I hear he's got a deal with a time-travel fairy who brings him gear... even if it hasn't been forged yet! The items might show up later in the game or might be Rares that are NEVER seen again! 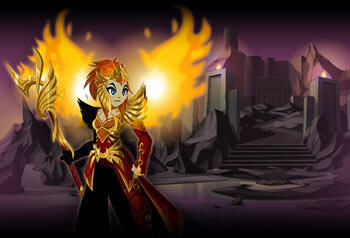 Later this week: MORE Quibble shop previews - Memet's Ashen and Mana Phoenix Pyromancer gear! The World Breaks as the Ancients Return! After the Champion of Chaos let the Queen of Monsters loose, refugees from across the world flee to a new continent as the land grows colder and winter storms rage. Fight alongside Syrrus the Astromancer at the shattered Tower of Winds. Build a planetary gate that will allow a mysterious warrior mage's army to journey across spacetime and add their blades to the battle! The WorldBreaker Rises as twilight falls across the world. Past, present, and future Frostval items freeze the insides of Quibble Coinbiter's pack... and YOUR inventory! AQWorlds' very own time-traveling sales moglin arrives in Battleon this Friday, December 19th, with gear from across space AND time! But he won't be there long, so you'll want to dig through his chest of never-before-seen-slightly-used items and rares while you can! FrostSpawn Warrior and AstroMancer armor! Announcing the Coolest Class: CryoMancer! Once the CryoMancer Class releases, speak to Syrrus Terminer in the Tower of Winds OR talk to Quibble in Battleon! Both will have daily quests that rewards you with Glacera Tokens when you complete them. Non-members can earn up to 14 a week but there is a special Member version of the quest that will reward Members with up to 21 Tokens per week. MEMBERS: You will only be able to do ONE of the quests per day. MAKE SURE YOU DO THE MEMBER VERSION! As always there will be an AC version of the class for those who don't have the time to invest in earning the class for free. Frostval Limited Quantity Packages Next Tuesday! Starting next Tuesday, December 23rd at 10:30 AM EST, our Frostval Limited Quantity Packages will go on sale! There are a limited number of packages, so if you want to snag these ice-cold collectibles to boost your rare collector rep, read on to see what's coming! Keep an eye on the Design Notes for more art previews, quantites, and a restock schedule! 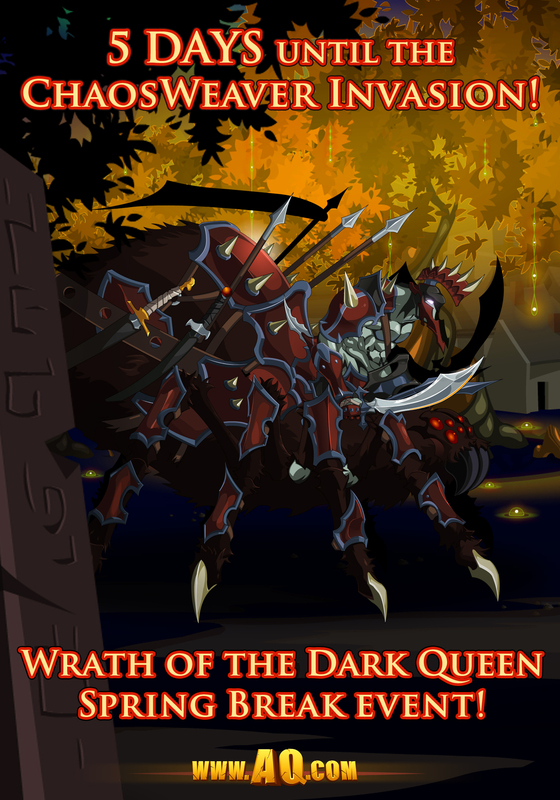 The Wrath of a Dark Queen Event Begins Friday! ChaosWeavers - deadly, spider-like beasts from below the surface - are flooding into the towns and cities of Lore with only one goal: to prepare the world for the arrival of their Queen! Pierce the web of deceit being spun around you before everyone you know falls to the warriors of Ravenloss! Chaosweavers, Dreadspiders, and Arachsya, OH MY! THIS time around, though, you've got no time to study SoulWeaving. YOU have a nation of very angry, VERY deadly creatures to kill before you seal the portal bringing them to our world! Riadne and Tomix will help you here, then journey with you to Ravenloss itself NEXT week! * The Legend-only Twilight map will be getting some new quests, rewards, and updated art for the Dreadspider! Dage is creating the Class art now... expect previews later this week! Today's Server Boost: Class Points! Continuing with our Spring Break Server Boosts, we're keeping the double Class Points boost active! This week, he'll be bringing the Ascended SoulWeaver armor (with and without extra cape tail), the SoulBinder Armor, Tomix's Judgement Scythe**, Pandora's Rage and Hope Blades**, and more! ** Because Tomix needs to focus on the Ravenloss Part II Saga in DragonFable right now, he cannot come help AQW with the release. He IS sending you some of his favorite DF art to show he'll be there in spirit! Quibble Waits in Battleon While Dage Destroys Frostval! 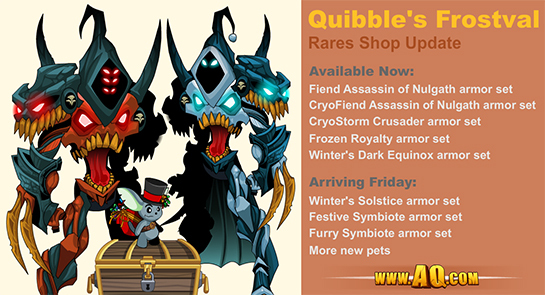 Past, present, and future Frostval items freeze the insides of Quibble Coinbiter's pack... and YOUR inventory! AQWorlds' very own time-traveling sales moglin arrives in Battleon tonight, December 20th, but he won't be there long, so you'll want to dig through his chest of never-before-seen-slightly-used items and rares while you can! Holiday Pets full of Hope, Cheer... and Fear! We've been making additions to some of our armors! The Lunar Sandknight! 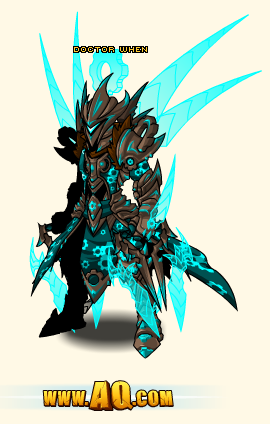 Reens will be adding the color-custom code to the rest of the Lunar Sandknight set in Quibble's shop today. She's back in action today, but let's all cast /heal on Reens' household to drive away the Sick! 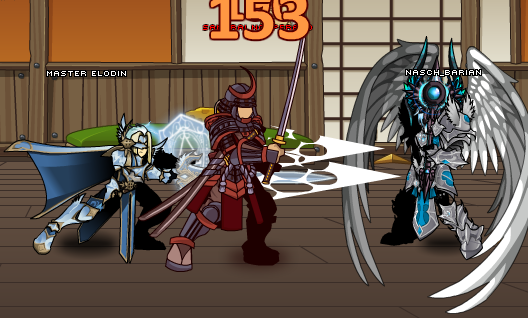 The armor, helms, sword, and wings will ALL be color-customizable! Over the weekend, we fixed the issue on an armor released in February which made the skirt disappear and left just the bikini bottom showing. We are very careful to release armors which we feel will appeal to the majority of our playerbase while keeping in line with our E-10 rating, but sometimes mistakes and bugs slip in. Though the armor looked unbroken (if more revealing than we normally allow) when you review at our other Carnival armors, you see the lower halves of the female armors are much more covered than the Plume armor, having skirts or bottoms which cover their entire lower torso. No other older armors are going to be changed at this time. Later today, the sellback price will be raised to the original purchase price. If you do not wish to keep the armor, go ahead and sell it and you'll get all 600 ACs back. If you sold the armor already (after it was changed), we will run a query to give you the difference. Find the Evolved Chronomancer at HeroMart! If you haven't seen our new 2014 Artix Entertainment Calendar Poster, head to HeroMart! You'll get the ChronoCommander Class and armor set! 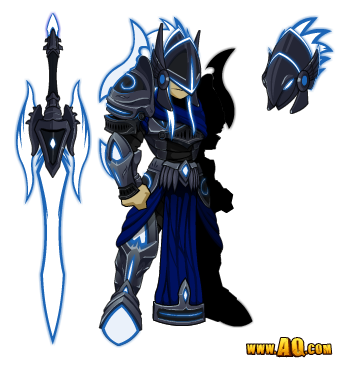 AND... later today, we'll also add the Evolved Chronomancer Armor set from Tyronius! 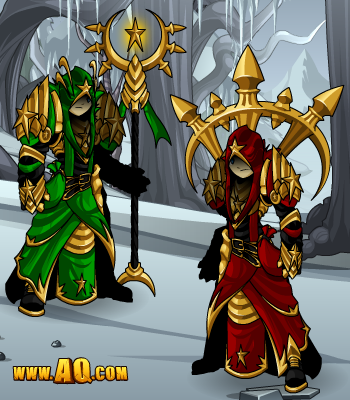 If you already purchased the 2014 Calendar, you'll find this gear in your badge shop in the Book of Lore, along with all of the other in-game items that already came with it!! Mirror and Chaos Gear for ALL Lore's Heroes! Well hello there, Hero. Welcome to my treasure shop! * Are you ready to meet the 13th Lord of Chaos for the first time?! Then get ready to save Lore from their anarchy! 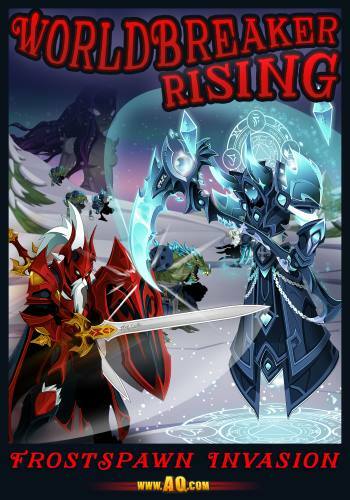 Find Drakath in the heart of the Chaos Realm! Quibble may have more information for you this Friday! Will the 13th Lord of Chaos shatter the moon... or just Lore itself? ** Thinking about this should hurt your brain. It hurts mine! When Does Quibble Coinbiter Arrive? ***** I wonder if Drakath has had a word with Quibble's time-travel fairies... O_O!!! Other AQW news to know! Artix's high-level, high-XP farming map is live! You've got to find it first, though! Our experienced players know to hunt around, clicking on anything and everything! J6's birthday is today! Head to the Hyperium to check out his birthday gear! The 1st place winner for the Luck of the Draw contest will be announced tomorrow! ALL winners will get their prizes in their inventory! The Stack of Fortune Ticket bug should be fixed. Please let us know if it's working for you! Check out the 2014 Artix Calendar AND the Artix Logo T-Shirt on HeroMart.com!